A powerful novel from the North, winner of national book awards both in Norway and Sweden. Its hero is Edmund Saknevik, orphan, outcast and seeker, who has returned from exile to Norway to farm his ancestral estate. The country he finds is transformed: friends have matured and made their careers, foreign influences have supplanted native ones and oil interests ravage the landscape.Yet the past endures in the traditional celebrations, the prominence of the church and the bitter memories of the Nazi occupation. People still love, plot and keep grim secrets. Edmund's attempt to reclaim his history, his language and his purpose in life, as well as to preserve his country's culture and environment, retells the timeless and universal story of a man seeking to regain paradise, to make a home in the world and to redeem past mistakes, both his own and those of his family. Ave Eva is a dark, brooding and yet brightly courageous work with the power to speak to any reader, whatever his or her homeland. Edvard Hoem is a major writer of modern Norway, following in the radical tradition of Knut Hamsun and Jens Bjørneboe. He writes in Nynorsk ("New Norwegian"), the second official language of the country and the one with its roots in the speech of the people. (The first is Bokmål — "Book Language.") He has written poems, plays and ten novels, and recently he collaborated with the composer Henning Sommerro on a song cycle and a passion play about the last days of Christ. He also has translated several plays by Shakespeare into Nynorsk. 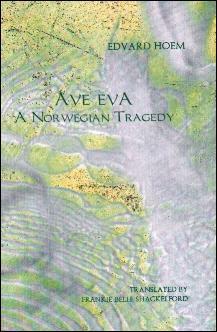 Ave Eva is a work of his maturity and one steeped in the language and recent history of his country. To make the novel readily accessible to the America reader, translator Frankie Belle Shackelford has provided a short introduction, a list of characters and notes on the language and setting, including a map. She has transmitted the peculiarities of Nynorsk in a rippling modern English with a few quaint and attractive features. Ave Eva immediately conveys one into a distant, beautiful and yet disturbed world.